The ramp-up phase of the GRAPHENE Flagship project is funded by the Seventh Framework Programme of the European Community for research, technological development and demonstration activities (2007-2013), as part of the FET Flagship Programme. 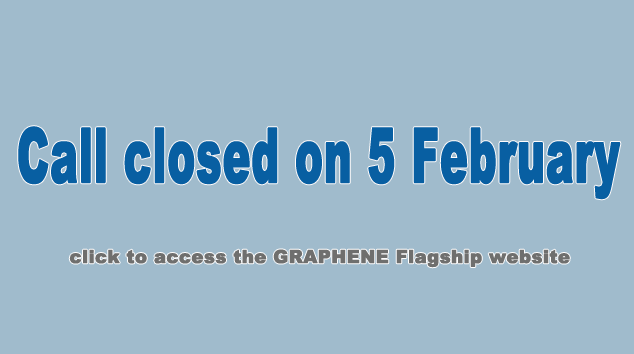 The GRAPHENE Flagship Project consortium will be extended with new partners demonstrating complementarities to carry out specific research tasks within the project. The new beneficiaries will be selected from proposals submitted in response to this Competitive Call (rules of participation) and having comprehensive expertise in the topics detailed in the call document. This competitive call is intended to further strengthen the engineering aspects of the flagship The present competitive call addresses 12 research topics and one support topic, these call topics do not present a one to one correspondence with the GRAPHENE Flagship work programme but should considered as elements cutting across some of the Work Packages interest. The 13 call topics are detailed in the call document and on the 'about the call' page.